The Algerian longest serving president is celebrating his 81birthday on March the 2nd. Abdelaziz Bouteflika is an Algerian politician who has been the fifth president of Algeria since 1999.He was the first child of his mother and the second child of his father. His father is Ahmed Bouteflika and his mother is Mansouria Ghezlaoui (from Tlemcen). He has three half-sisters; Fatima, Yamina and Aïcha, and four brothers; Abdelghani, Mustapha, Abderahim and Said, and one sister named Latifa. Abdelaziz memorized the Qur'an at young age. He continued his education in Oujda (Morocco) until the high school. At the age of 19, he joined the Army of National Liberation which was a military branch of the National Liberation Front (FLN).After independence, he was appointed as minister for youth, sports, and tourism. Later, he became the administrative secretary of the president Houari Boumediene. He has also served as president of the United Nations General Assembly in 1974. He was the foreign affairs minister for 16 years (from 1963 to 1979). In 1981, corruption charges drove Bouteflika into self-imposed exile. In 1999, Abdelaziz Bouteflika won the landslide election victory. During this first term (1999-2004), he presided over the end of the bloody Algerian Civil War to which he put an end through his amnesty plan. He was so active in the international arena; he presided over the African Union in 2000, secured the Algiers Peace Treaty between Eritrea and Ethiopia, and supported peace efforts in the African Great Lakes region. Relations with the Kingdom of Morocco remained quite tense, with diplomatic clashes on the issue of the Western Sahara. He also secured a friendship treaty with nearby Spain in 2002, and welcomed president Chirac of France on a state visit to Algiers in 2003. This was intended as a prelude to the signature of a friendship treaty. In 2004 Bouteflika organized the Arab League Summit and became President of the Arab League for one year. Algeria under President Bouteflika has won praise from the West for backing the US-led "war on terror". On 8 April 2004, he was re-elected for the second term by an unexpectedly high 85% of the vote. 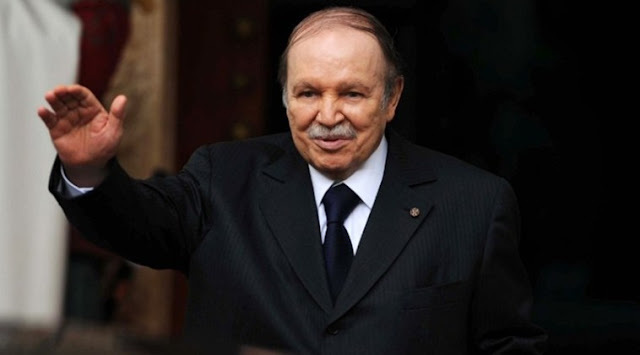 In this term (from 2004 till 2009), Bouteflika held a referendum on his plan "Charter for Peace and National Reconciliation" which aims at ending the Algerian civil war (black decade), from a political and judicial point of view. He has received large popular and political support on this issue. He granted wide-ranging amnesty to militant Islamist groups within Algeria in an effort to resolve a long-standing civil conflict. His term was also characterized by five-year plan that aims for the construction of 1 million housing units, the creation of 2 million jobs, the completion of the East-West highway, the completion of the Algiers subway project, the delivery of the new Algiers airport, and other similar large scale infrastructure projects. On the international scene, Bouteflika's second term has seen diplomatic tensions rise with France, which ended up with the signing of a friendship treaty with France (23 February 2004, re-endorsed in December 2005). Ties to Russia have been strengthened by large imports of Russian military hardware (about 7 billion USD were spent in one single purchase). Bouteflika has also carefully cultivated a relationship with China, with exchanges of state visits between the two countries. In 2008, Algeria repeatedly refused to answer Moroccan demands to open the common land border, which has been closed since 1994; therefore, relations with Morocco remain poor. Many of Bouteflika’s foreign affairs policies and decisions are characterized by a “principle of non-interference” in other countries affairs. In sub-Saharan Africa, a major concern of Bouteflika's Algeria has been on the Tuareg rebellions in northern Mali. Algeria has asserted itself forcefully as mediator in the conflict, perhaps underlining its growing regional influence ,thus , Compromise peace agreements were reached in 2007 and 2008, both mediated by Algiers. In 2005, Bouteflika experienced health problems; nevertheless, he was elected to a third term in 2009. He made it possible through changing the Algerian constitution, which had previously limited the president to two terms. Following the constitutional amendment allowing him to run for a third term, on 12 February 2009, Bouteflika announced his independent candidacy in the 2009 presidential election. On 10 April 2009 election, he was received more than 90 % of the vote, thereby obtaining a new five-year term. In spring and summer 2013, Boutflika stayed nearly four months in a hospital in Paris dealing with health problems. Following another constitutional amendment, allowing him to run for a fourth term, Bouteflika announced his candidature in the election. On 18 April 2014, he was re-elected with 81% of the vote despite he was very seldom appeared in the electoral campaign. Thus, he was elected for the fourth term (from 2014 till present). In November 2016, he was hospitalized in a clinic at Grenoble in France for medical checks that’s why he was rarely seen in public afterward for more than two year. In June 2017, Bouteflika made a rare appearance on Algerian state television presiding over a cabinet meeting with his new government. He ordered the government to reduce imports and curb spending.